Tickets will be printed in six series. The maximum retail price of one ticket will be Rs.200/-only (face value 78.58+12%GST). One book of tickets will contain ten tickets. The First to Third prizes will be drawn in full coming under the assured portion of prizes. The remaining prizes will be under variable portion depending upon the sale of tickets. 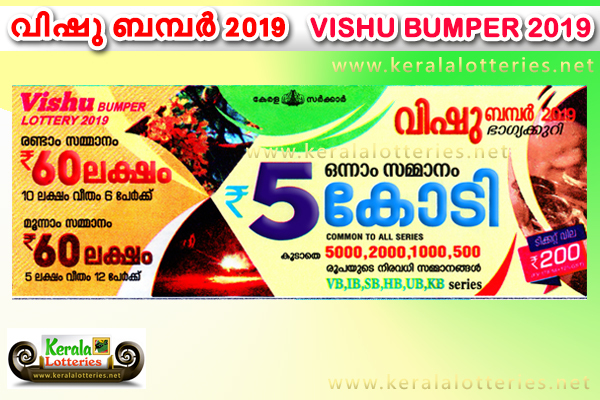 The consolation prizes of Rs.1, 00,000/- each will be awarded to the tickets in the other five series, having the same number of 1st prize winning number. The Fourth prize will be determined by drawing the last five digits one time and extended to all sold tickets in 6 series. The Fifth prize will be determined by drawing the last four digits thirty-five times and extended to all sold tickets in all series. The Sixth prize will be determined by drawing the last four digits forty times and extended to all sold ticket", in all series. The Seventh prize will be determined by drawing the last four digits fifty-six times and extended to all sold tickets in all series. The Eighth prize will be determined by drawing the last four digits hundred and twenty-five times and extended to all sold tickets in all series. An amount equivalent to 10% of prize money on 1st to 4th and consolation prizes will be deducted from the prize money and paid to the respective agents as agents commission on the prize. An amount equivalent to 10% of the prize money on 5th to 8th prizes will be given to the agents concerned as agent’s commission on the prize from the government fund. Registered agents will get the tickets at the following discounted rates, for the entire purchase irrespective of [The District of Purchase. If two or more agents become eligible for the special incentive at any of the above stage .or having purchased an equal number of tickets, the incentive amount will be equally divided among them, subject to the minimum of next lower purchaser. Common incentive prize of 1st and 2nd will be awarded to the agents for the highest purchase of and above 1000 tickets in each District, including District Lottery Offices and its corresponding Lottery Sub Offices. If more than one agent purchases the same number of tickets in a district the amount will be divided among them equally subject to the minimum of Common incentive prize 2. The prize-winning tickets should be surrendered within 30 days from the date of draw. The First to Third prize winning tickets should be surrendered to the Director of State Lotteries by a person or by insured! Registered post or through Nationalized/ Scheduled Banks State or District Co-operative Banks supported with necessary documents. ascertaining the genuineness of the tickets with counterfoils or by any other method as decided by the Director from time to time. Agents are allowed to collect prize tickets with prize money of Rs.5000/- and below and pay the prize money [0 the prize winners themselves and thereafter claim prize money 011 behalfs 01 prize winners by exchange of tickets. The agents should clearly, state whether the prize Tickets are collected and prize money already paid to the prize winners by them while presenting the same for payment. Claims on mutilated or tampered tickets will be rejected outright. One ticket can win only the I.ighcsr prize awarded on it. Income Tax and Surcharge etc. if any, will be deducted at- source from the prize money as laid down in the Finance Act (Central). 20. Legal jurisdiction of this Lottery will be at Thiruvananthapuram.